Topics: Limousines, Services, Packages, & References. dns2.site5.com, & dns.site5.com are its DNS Nameservers. Digital Pacific Pty Ltd (New South Wales, Sydney) is the location of the Apache/2 server. 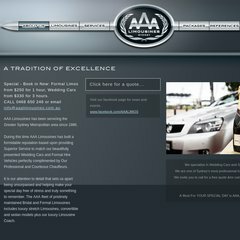 Aaalimousines.com.au's server IP number is 101.0.76.6. PING www. (101.0.76.6) 56(84) bytes of data. A ping speed test response, is timed at 189 ms.